Excluding the Maryland State Monument, there are nine monuments at Antietam National Battlefield that mark the approximate battlefield position of military units from Maryland. 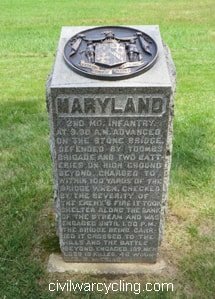 Finding Maryland monuments at Antietam is not hard, but if your goal is to find them all in one battlefield tour, a little planning is required. This is mostly because two of the monuments are in the far south portion of the battlefield and the others stand in unassuming (and sometimes surprising) locations. 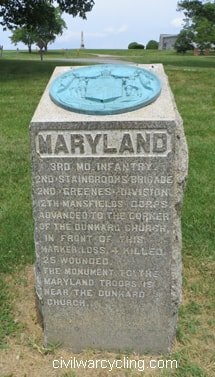 All but one of the Maryland regimental and artillery monuments are simple, largely uniform, eighteen-inch-square rough-cut granite structures that stand anywhere from three- to five-feet tall. 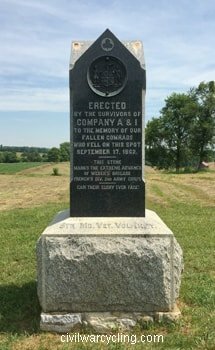 The lone stand-out is the 5th MD Infantry’s monument for Companies A and I, which has an obelisk shape and stands almost 9-feet tall. The seal of the State of Maryland is mounted on every monument, and seven of these seals have oxidized (to give the bronze a bluish-green color). 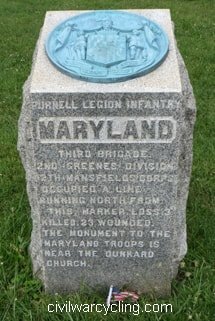 Except for the inscriptions, the two Maryland Confederate monuments are indistinguishable from the seven Maryland Union monuments. The monuments are listed in the following table. 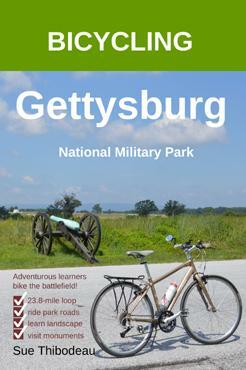 Can you find the monuments (above) at Antietam National Battlefield using the following maps? Give it a try! I am deliberately leaving this work to you as a learning exercise. As you interact with the maps, photographs, and above table, I believe that you will find yourself learning more about Antietam National Battlefield. 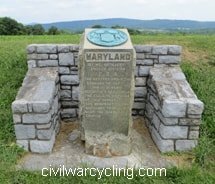 Finally, it’s time to plan a bicycle route that passes each Maryland monument. 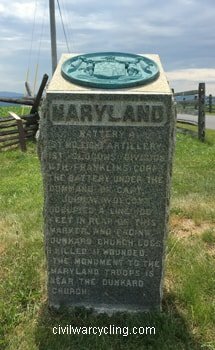 For finding Maryland monuments at Antietam, you have everything that you need right here! For the northern half of the battlefield, you can visit most Maryland monuments by following the National Park Service Auto Tour. 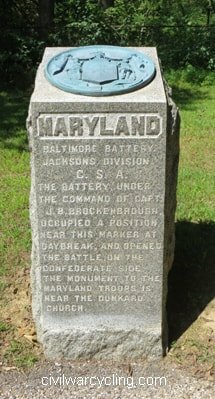 First, the 3rd MD Infantry Monument is on Dunker Church Road near the Visitor Center exit and near Auto Tour Stop 1. Follow Dunker Church Road north past Auto Tour Stop 1, and continue until the road bears right into the North Woods (Auto Tour Stop 2) and then south again to the East Woods (Auto Tour Stop 3). 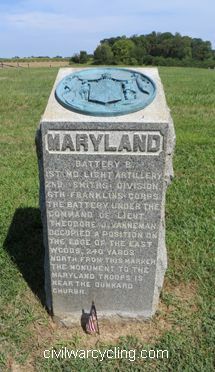 Pass the Battery B, MD 1st Light Artillery Monument on your right. Then, at Dunker Church Road, turn left toward the West Woods, heading south. 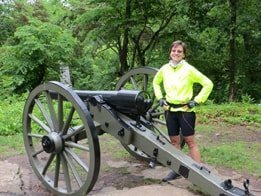 Turn right into the West Woods (Philadelphia Park) to visit the Baltimore Battery (CSA) Monument. Turn around to get back to Dunker Church Road, where you will turn right and then left onto Smoketown Road. Make your first right onto Mumma Lane to visit the Battery A, MD 1st Light Artillery Monument on the corner. Follow signs to Auto Tour Stops 6, 7, and 8. The two MD 5th Infantry monuments are along the Sunken Road (Richardson Avenue) on the left. 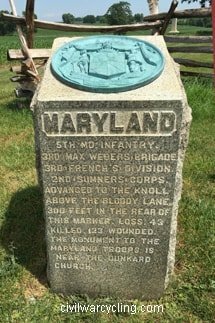 Thanks for Finding Maryland Monuments at Antietam!